It's time to celebrate and have a cookies for your holidays season, since we only 3 weeks away from christmas. With this easy and delicious butter cookies you'll have a tasty tea time with your family. I used to make these cookies for every time of the year but i also will enjoy it in my christmas this year. 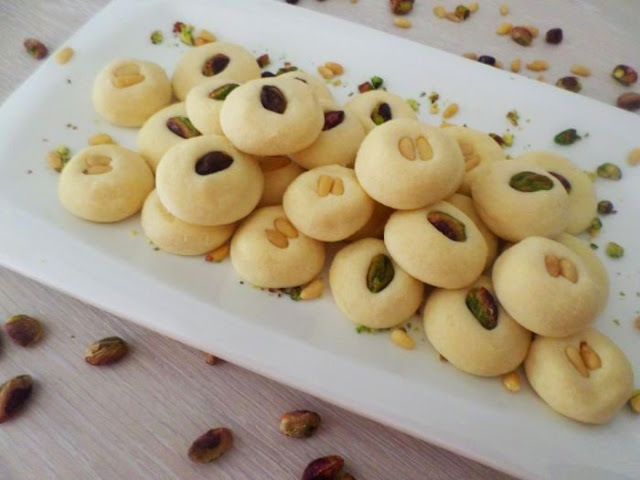 You can make it in deffrients shapes, i decorated it with press the top cookies with a fork or simply place a pistachio, pine and almond on the top as i did this time, this easy cookies takes only a simple 4 ingredients and very easy to follow steps, so lets make some. Preheat oven at 180°C, only turn bottom heat oven. In a mixer bowl mix the butter with the sugar and vanilla until fluffy and light in color. Add flour gradually until you have a smooth and buttery cookie dough. Take about tablespoon of the dough, shape as soft small balls. 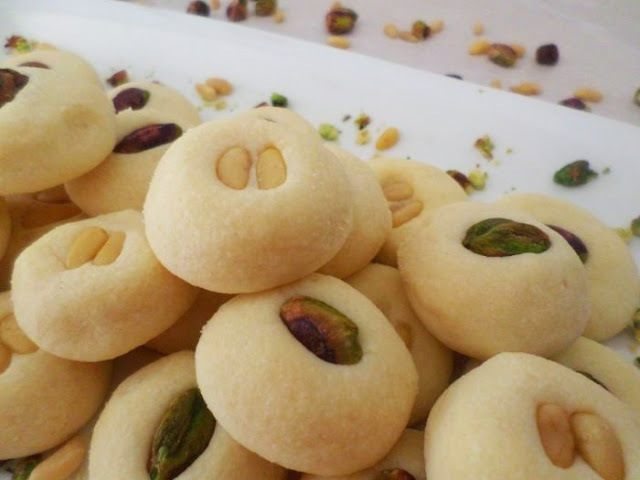 Place cookies in an oven tray, top each cookie ball with pistachio, press a little bit to flatten the cookie. Bake on preheated bottom heat oven 180°C for 8-10 minutes. Cool completly before moving from oven tray, otherwise it will crumble.